How's It Sounding? : Dude, Did You See That Sound!? Evan Grant did a wonderful job about explaining this topic that I had seen, but didn’t see a purpose for. If you are interested in audio, you have probably seen this example on YouTube with a metal plate, sand, and a driver, or at least videos like it. I always thought it looked cool, and I knew what caused it, but what purpose could it serve? Grant was able to convey this topic well. His start with historical experiments definitely gave him credibility in my book. It was obvious he was passionate and knowledgeable of this subject. He could have plugged his own work throughout the whole speech, but most of it focused on others’ works and experiments, which was a great touch. More importantly, all of that allowed me to have a deeper understanding of the topic. What else can this be used for? I personally can see this being implemented into video games and music videos. There are instances of this of course in things like the is iTunes Visualizer, but as technology and graphics progress, could you imaging seeing your music in 3D? Sounds crazy right!? Imagine a video game that takes place in the future. You throw a sonic grenade. When it explodes, fire shoots out in a devastating swirl that represents the sound it’s making. Or perhaps it can lead to a new type of interactive audio game where you drawn swirls and they are played back to you. What about one step further? Since these audio visualizations represent what we can see in nature, why not have an interactive virtual world that instead of seeing things like snowflakes, we see the audio representation that looks like it? When you touch the world, you hear it. You hear what you see. 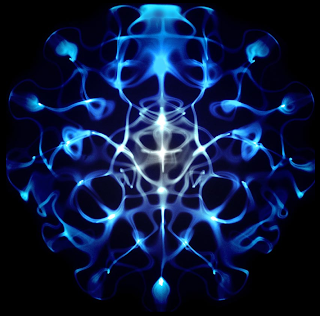 Cymatics: another thing to blow your grandparents’ minds. To see the TED Talk speech, you can click here.